Pendants, Chains, and Cords - Being Updated as You Read This! Less is more. I never understood that phrase until I found some spectacular blue kyanite pendants that radiated moonlight and starlight. Commanding a solo turn on the stage, they need no other adornment or distraction. Oh, sometimes I want to flank them with some smaller stones, some handmaidens. But all these really need is a chain or cord to hang from, attached with a simple loop or bail. 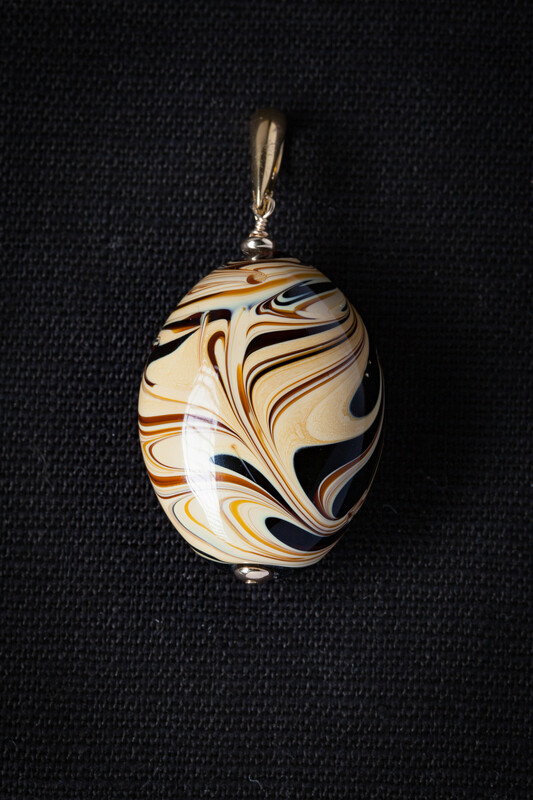 I use a hinged bail so you can switch any pendant from one chain or cord to another. Flip up the back, switch the pendant to another chain or cord, click the back closed. Done. Buy only the pendant if you already have the right necklace. If you need a necklace to complement your pendant, by early May the site will contain an assortment of chains and cords to tempt you. You decide which you love the best. 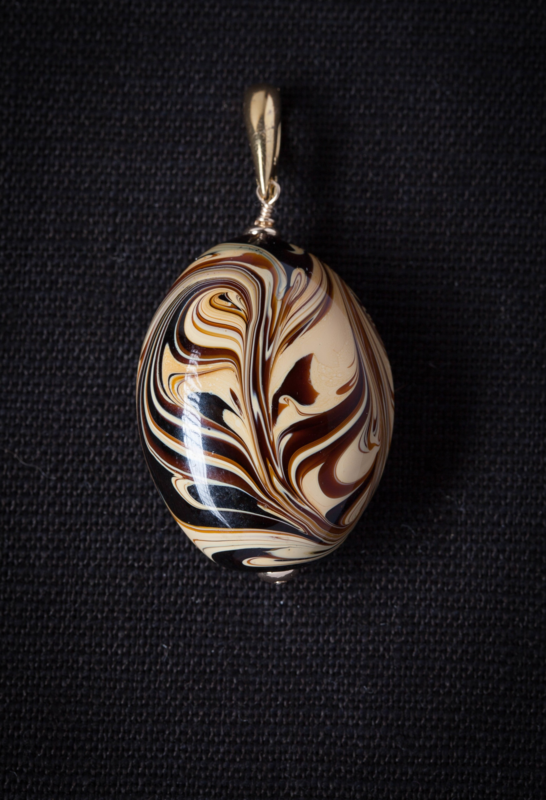 All the pendants on this page are semi-precious stones with the exception of the cane glass. 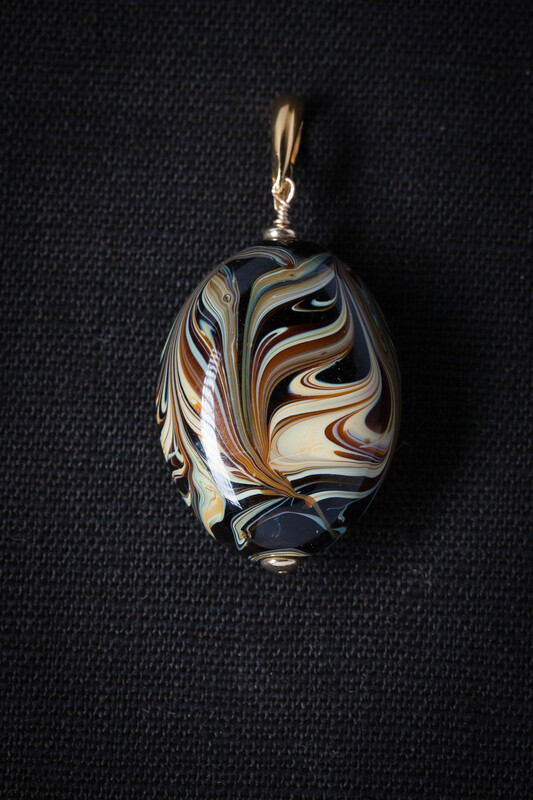 All pendants are unique. You will see several choices for kyanite, boulder opal, cane glass - my hot fudge sundaes! 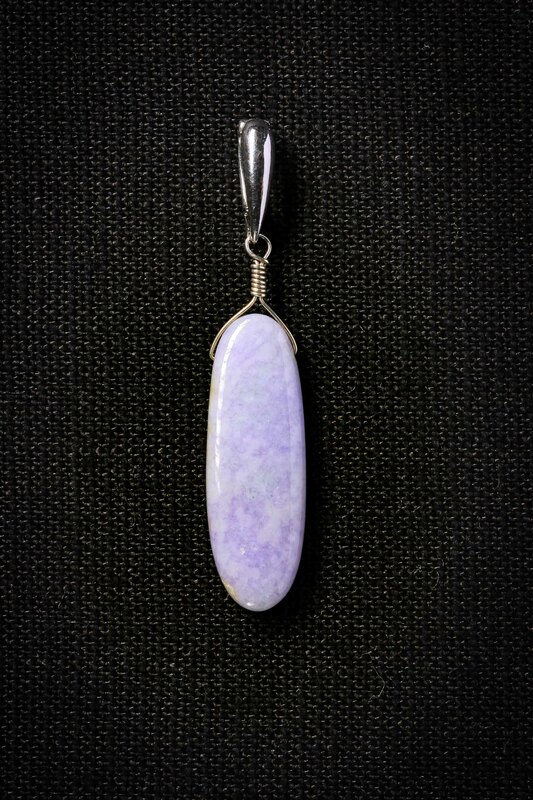 - lavender jade, matte lapis. Some have been sold. I have kept them on the site so you can see examples. Perhaps you love the vertical line in the Moonlight kyanite. Ask me to watch for another. The pieces not marked sold are available. In addition, I have more of these stones in my stash, and I keep buying the ones that are still being cut. 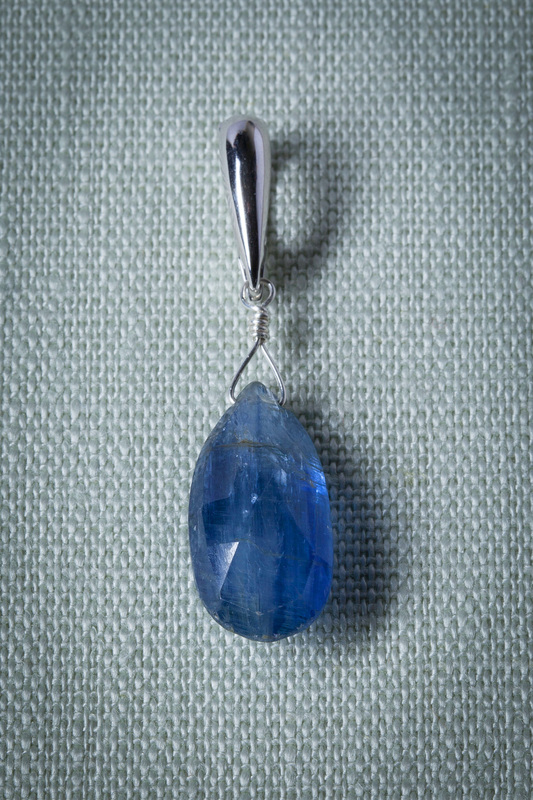 Found in many countries, with the finest said to come from Nepal, this sparkling blue stone glistens with the celestial sky show captured within. It's available in a range of blues, from deep and dark to whisper pale. It's cut into nearly transparent high glitter faceted pendants, midnight blue briolettes, and shining translucent and opaque rounds. I have not seen these briolettes in over a decade. I keep hoping they'll be cut again someday. 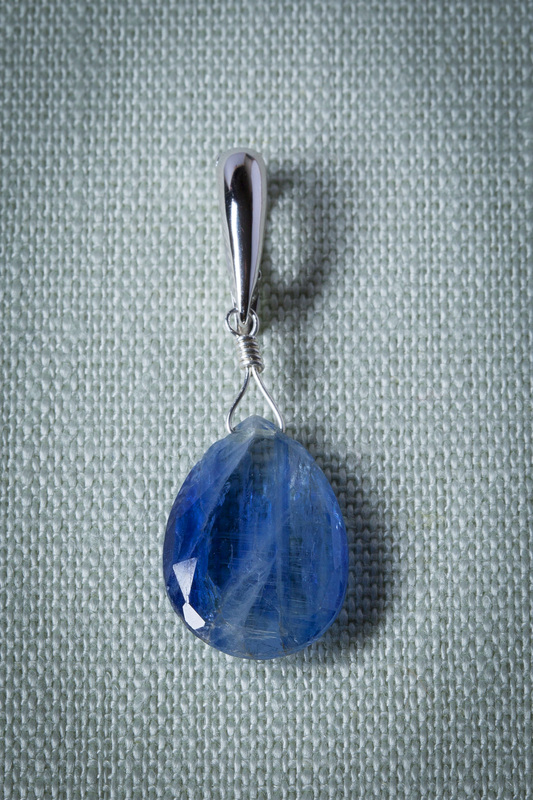 Kyanite is a talisman to wish on, a stone to inspire wild romantic fantasies. Picture the royal lovers on the beach at midnight, the surf pounding. He clasps her to him and whispers, "I must leave tonight." She touches his face and breathes, "Will there be danger?" He points a finger at a rock on the sand. Light flashes from his fingertip and the rock blazes, transformed. He picks it up and puts it in her hand. "As long as you have this stone I will be safe." They hold each other tightly. Kyanite, Sterling Silver. Height with Bail: 1 3/4" Width: 9/16"
A pale gray cloud rises in a soft diagonal, distant stars twinkle along the rounded bottom. Wear it and you will be airborne all day and into the night. Kyanite, Sterling Silver. Height with Bail: 1 7/8" Width: 9/16"
Starlight shimmers against a rich blue background in this breathtaking stone. Hmmm...I think I'll wear this one today. Kyanite, Sterling Silver. Height with bail: 1 7/8" Width: 1/2"
A translucent vertical moonlight path lights up the surrounding dark blue night in this mysterious stone. You could step out on that lightway, following it to the skies, easy as a walk in the park. Boulder opals are my latest passion. Found only in a small area of Queensland, Australia, they display rivers or fields or tiny flash points of opalescence, brilliant blue, teal, green, violet, red, and/or white opal on an ironstone background. The ironstone is patterned in earth tones, ranging from deep brown to sandy tan. It makes a handsome base. 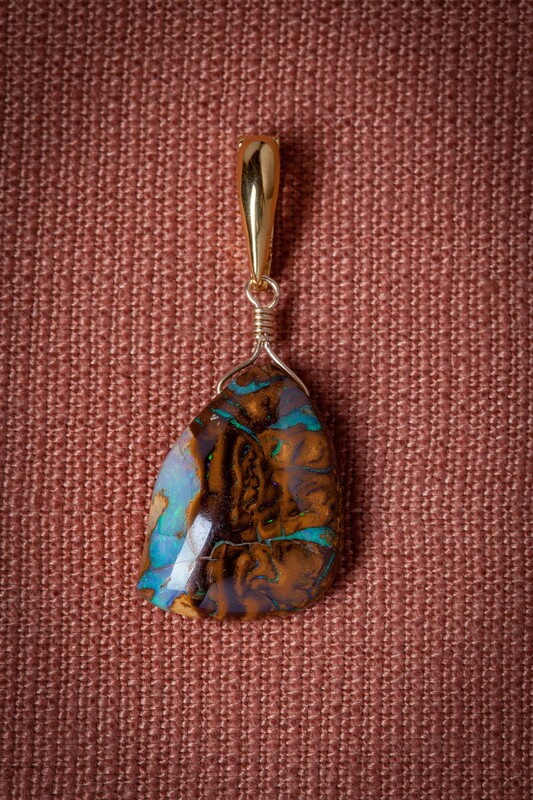 You can expect stones shimmering with more opal and dramatic color contrast to command higher prices. Carat weight is also important. 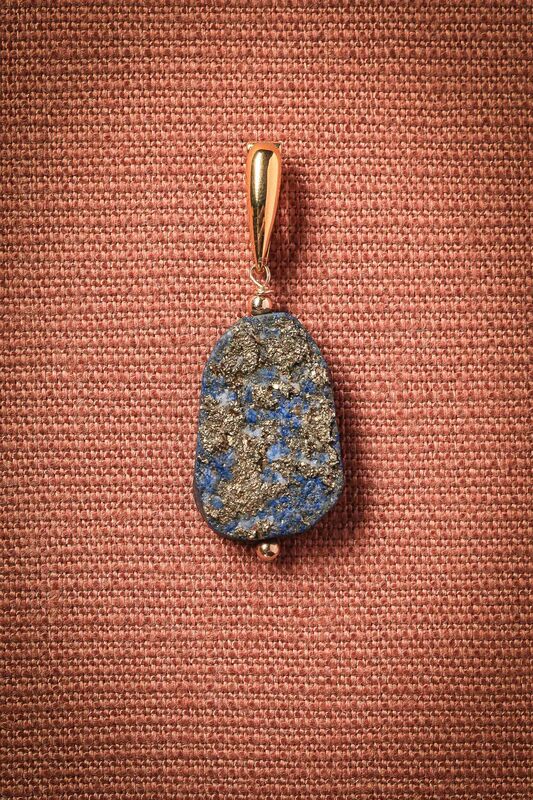 Boulder opal is being heavily mined and keeps increasing in value. Like the rest of these pendants, every stone is different. 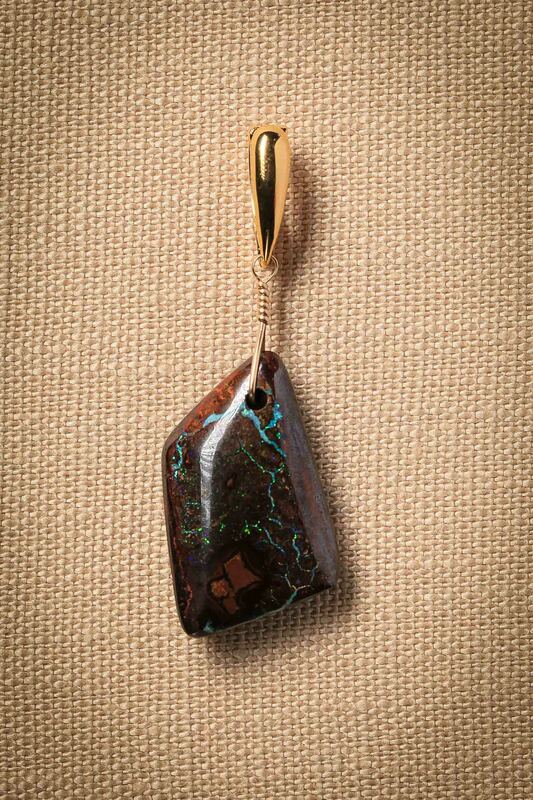 Boulder Opal, Gold Fill, Vermeil. 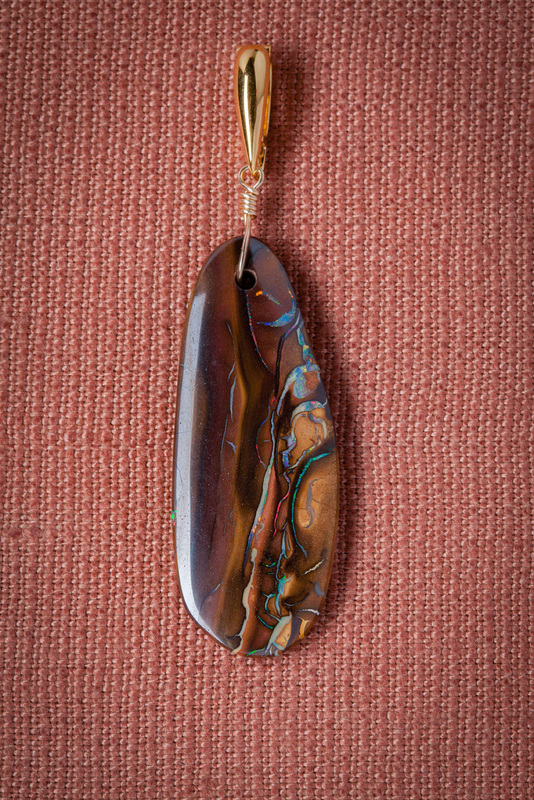 Height with bail: 1 7/8" Width: 13/16"
Boulder Opal, Gold Fill, Vermeil. Height with bail: 2 3/4" Width: 3/4"
Big and bold, scenic magic. primal and sophisticated. Imagine looking up the side of this cliff, all rock and earth, shimmering with rainbow cascades of waterfall. That's what I see. Tell me what you see. Boulder Opal, Gold Fill, Vermeil. Height with bail: 2 3/16" Width: 3/4"
In addition to a landscape of delicate streams, this beauty is alive with dazzling pinpoints of green and blue. It radiates playful vitality, perfect for a day - or night - when fun is the main theme. Boulder Opal, Gold Fill, Vermeil. Height with bail: 2 5/8" Width: 1 1/8""
A teardrop shining with aquas and a touch or two of deep orange. The purple that pops in the photo is almost subliminal in the stone, winking in and out as the light changes. The ironstone provides reassuring solidity in mesmerizing patterns. Most people react to these hefty cane glass beauties with wide eyes and open mouth. The words "hot fudge sundae" flash in my brain and I have to restrain myself from licking them. So far I've managed to do nothing more than stare and breathe a little harder. I've even stopped myself from searching out a real hot fudge sundae. 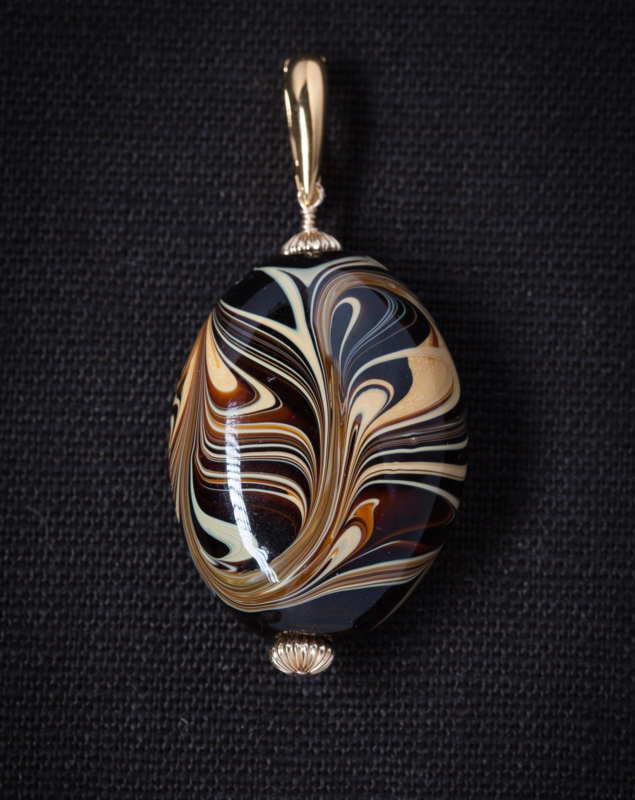 You may have to find a gentle way to dissuade dear friends and close relatives from wanting to "borrow" your pendant. Each side has a slightly different pattern. On the order screen, the large view defaults to Side 1. To enlarge Side 2, under MORE VIEWS, click the photo to the right. When you wear the pendant you can choose which side shows in one of two ways. You can open the vermeil hinged bail, take the pendant off the necklace, turn the piece, and click the bail back on to the necklace. The back of the bail will be showing. You'll notice that the back of the bail looks a little different. Both sides are beautiful, but the back has the 925 Sterling Silver stamp. If you don't want to display the stamp, the second way to change sides is to rotate the pendant. Grasp the wrapped loop and turn only the glass piece. Caramel Red Dot - Sold! Cane Glass, Gold Fill, Vermeil. Height with bail: 2 3/8". Width: 1"
Lovely swirls of color on this baby include a couple of reddish dots and subtle deep gray blues on Side 1. There are also some sharp angles, for those days when you've got an edge. Side 2 is energetic but a little more serene. Caramel and Cream - Sold! Cane Glass, Gold Fill, Vermeil. Height with bail: 2 5/16". Width: 1"
The Sundae is melting, all creamy and dreamy. Wear this when you feel voluptuous and langorous. Or when you want to. Cane Glass, Gold Fill, Vermeil. Height with bail: 2 7/16". 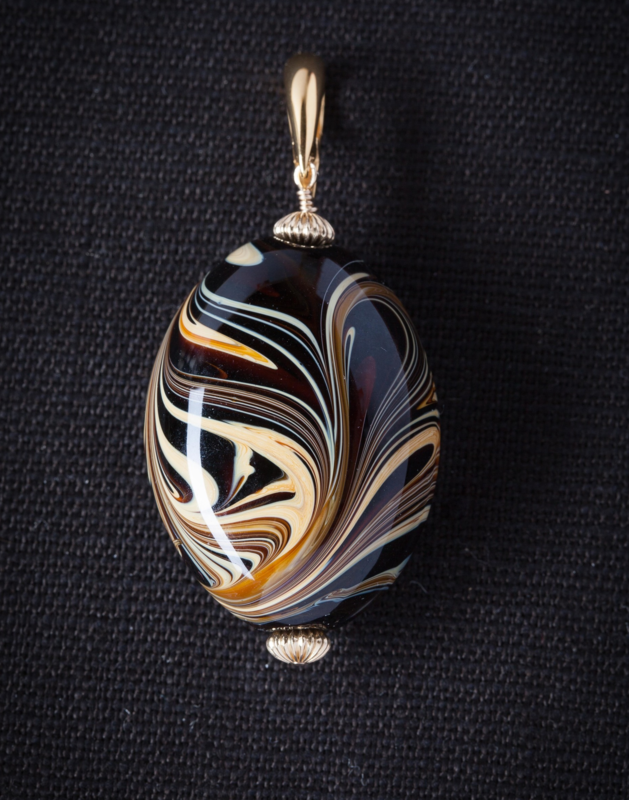 Width: 1"
These pendants are suave and subtle. Most are primarily lavender with "Come to me, look closer" combinations of lavender touched with clouds of whisper pale gray-green. They are soft and sensual to the eye, but like all jade, they are pretty tough. Height with bail: 2 1/4" Width: 7/16"
Imagine a light lavender sky, pale gray-green clouds billowing slowly across its surface. We could be on another planet, in another galaxy. What color sun would give us this breathtaking sky show? 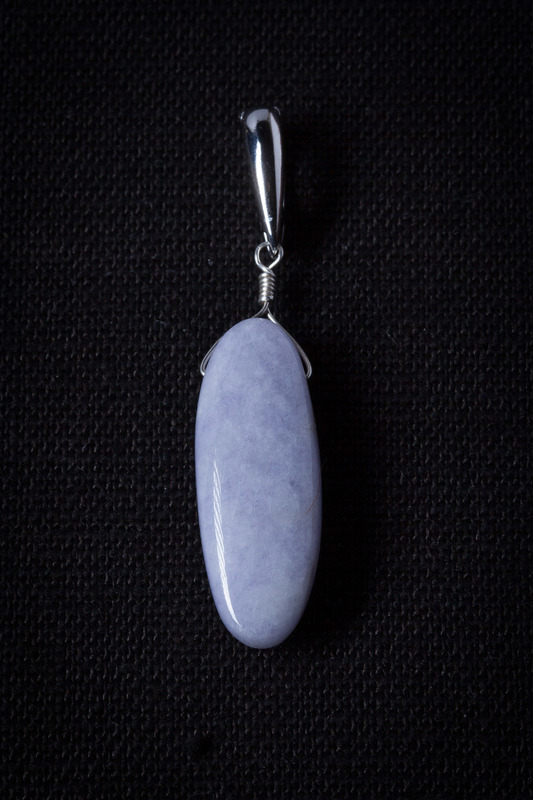 Height with bail: 2 1/8" Width: 1/2"
This pendant is a lovely rich lavender, tipped at each end with a pale gray green. The piece will make you feel feminine with a steely edge. 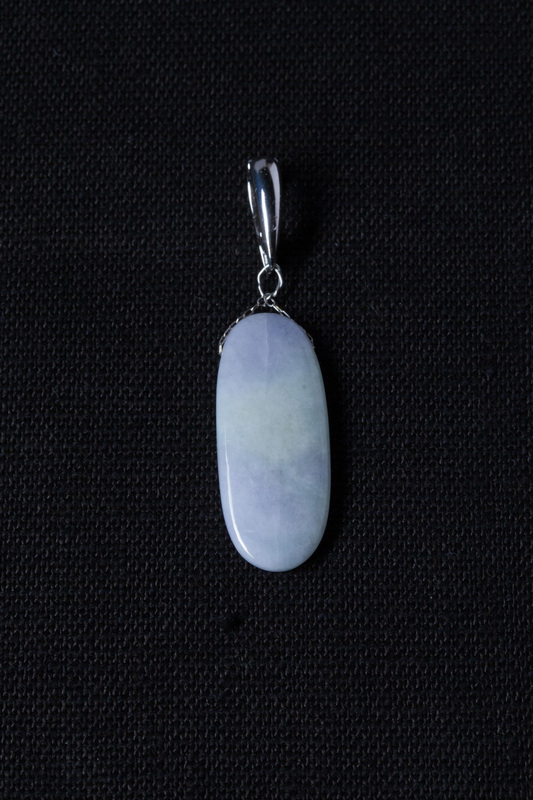 Height with bail: 2 1/4" Width: 1/2"
This flat pendant has hazy sections of pale green balancing the lavender. Height with bail: 2 7/16" Width: 1/2"
The ice princess is totally cool, super regal. I wear her when I want to feel quietly elegant, with total control over all my domains. She graciously gives me that power. 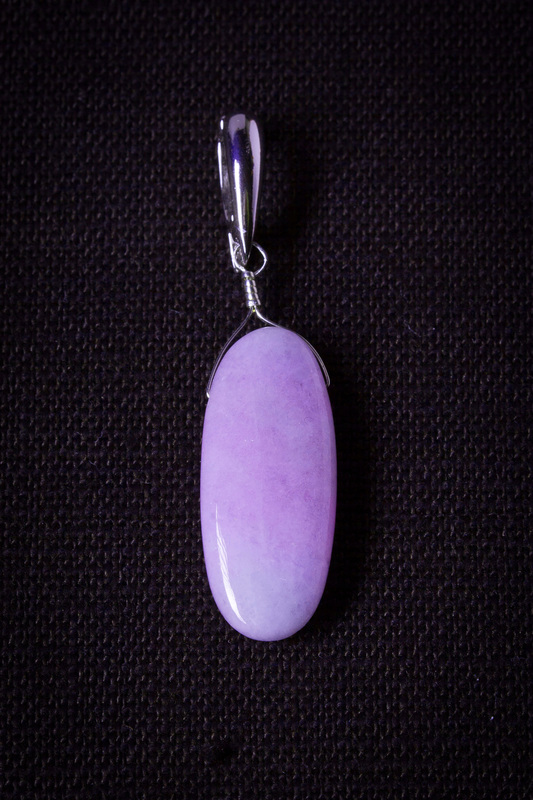 She is very similar to the first Lavender Jade, the clouds, so maybe you won't mind if I decide to keep her for myself. 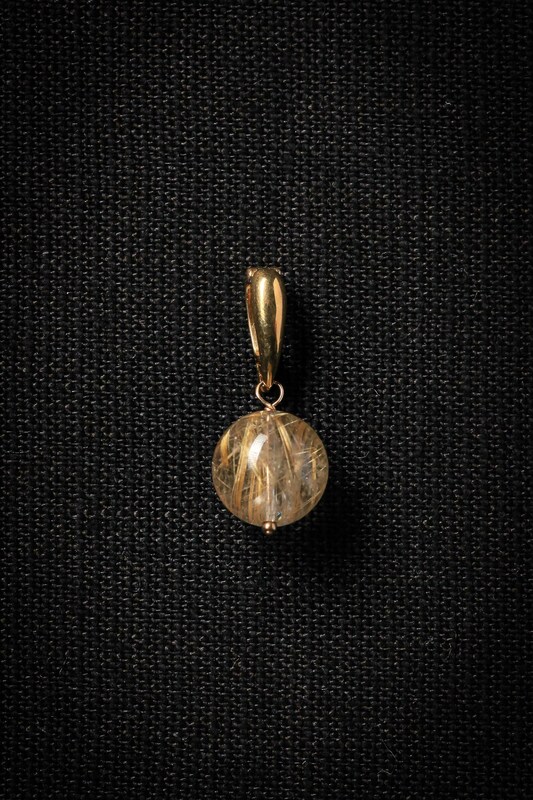 Gold Rutilated Quartz, Vermeil, Gold Fill. Height with bail: 1.12" Width: .5"
This ball of clear quartz is saturated with gleaming golden rutiles. It's simple, sophisticated and versatile. You can wear it with any color, to dress up jeans, enhance a business suit, sparkle at dinner in an elegant reataurant. 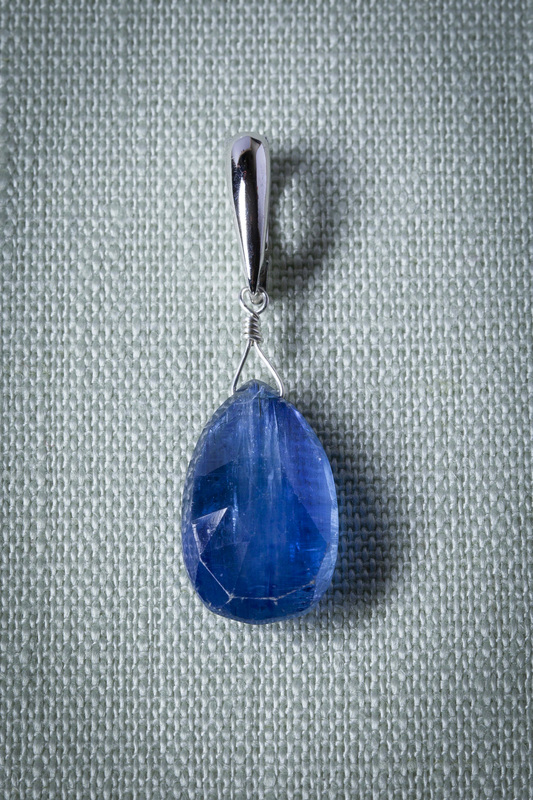 Cut, unpolished, the pure stone, close to nature, matte lapis lazuli is an unexpected recent trend. These pendants assert themselves with a spray of golden glittering pyrite. 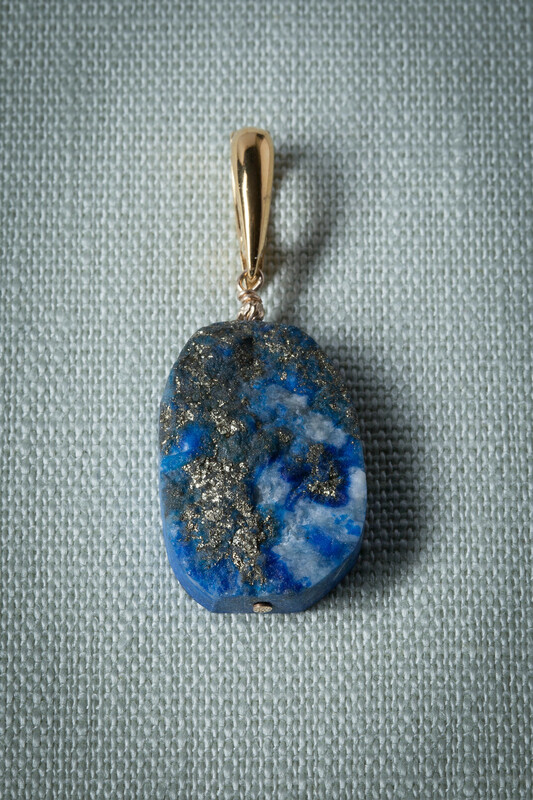 There is nothing shy about the deep blue of the lapis or the flashy sparkle of the pyrite. Some include fields or dots of white calcite, suggesting clouds, snow, cotton balls, pale reefs under the sea, white silk handkerchiefs... Wherever your imagination takes you. Matte Lappis with Pyrite and Calcite, Vermeil, Gold Fill. Height with bail: 2 1/8" Width: 12/16"
Matte lapis moves us beyond shiny. There's a fine tension between the elegance of lapis and the rustic, natural quality of the rough, unpolished surface. Pyrite is called fool's gold, but unless you're a miner, there is nothing foolish about it. The lapis setting gives it gravitas. 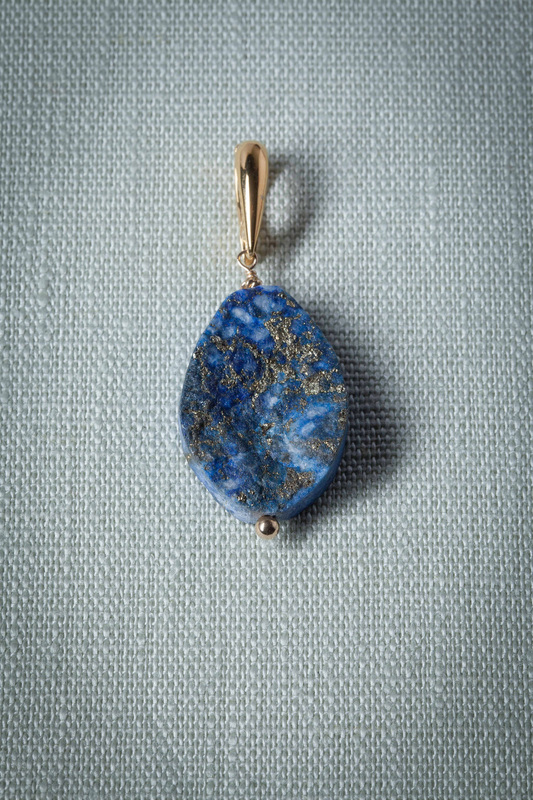 Matte Lapis with Pyrite and Calcite, Vermeil, Gold Fill. 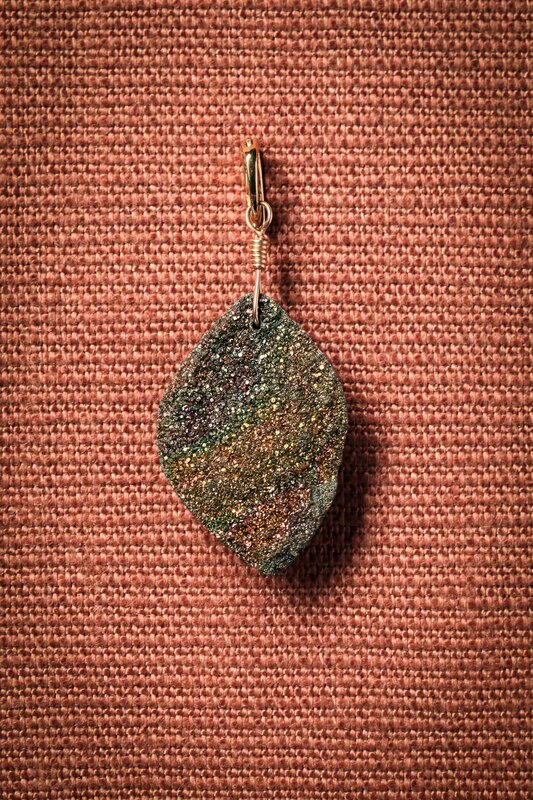 Height with bail: 2" Width: 3/4"
This stone is rough and earthy. The pyrite glitter is almost brown, the calcite areas are big and assertive. It's more plain-spoken, easier to wear with denim. It's just as beautiful as its siblings. Height with bail and beads: 1 7/8" Width: 3/4"
Classic and classy. Wear it when you want to shine and need to impress. It's an easy choice on a busy morning. With titanium-treated druzy all the rage, I always thought the vivid color in rainbow pyrite was crafted by similar human intervention. An article in Rock & Gem, a super magazine for rockhounds, set me straight, brilliantly explaining how the earth created this iridescence . Thanks to R&G and writer Steve Voynick. This one is sold. I have several of these spectacular stones and I keep buying more. Watch for them on the site late April. 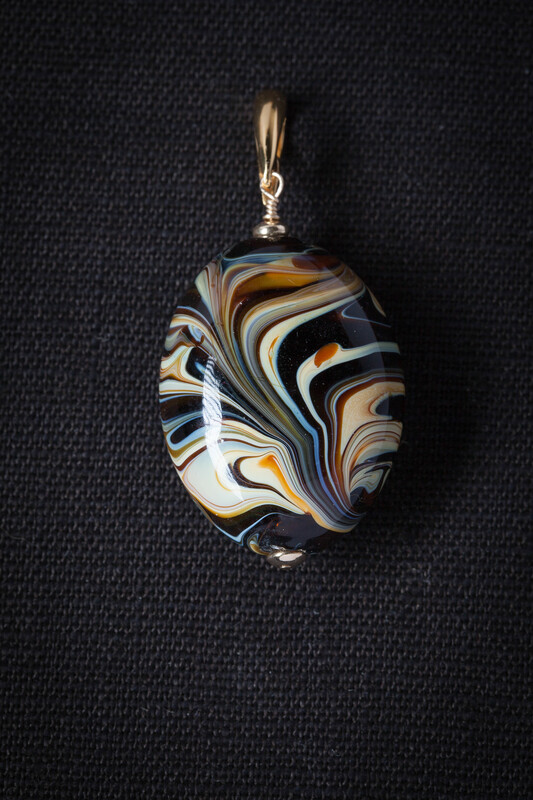 You may already have the perfect chain or cord for your pendant. 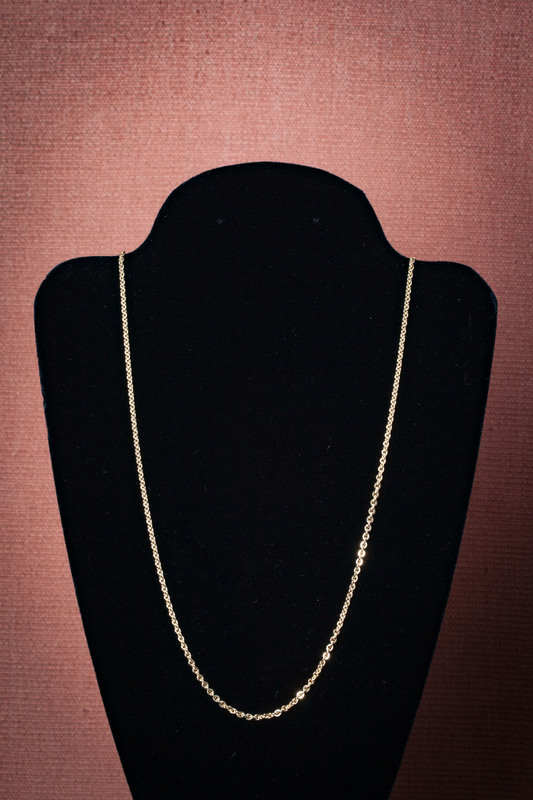 If not, here are some ravishing chains in gold fill and sterling silver. I prefer the three dimensions of cable, rolo, or wheat chains to flat curb chains, although I have been eyeing some big Figaro chains lately. I use hinged bails on all these pendants, so you can change them from one necklace to another. 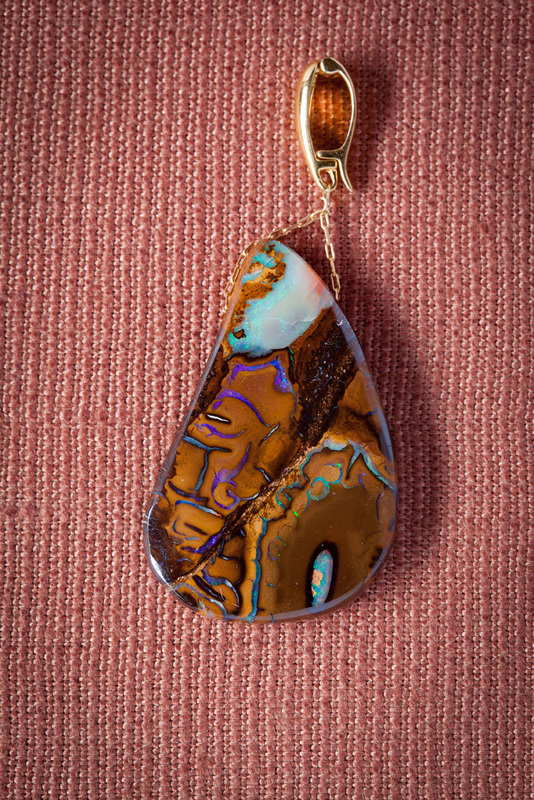 That gold chain may be perfect when you want to dress up a boulder opal and take it out on the town, but there will be times you want to be more casual, with a cord of satin, silk, linen, leather, or rubber. Yes, rubber. Read on! The chains and cords are available in lengths from 15" to 20". The glitter of a flattened chain is powerful and mesmerizing, edgy, assertive and glamorous. Each small oval link measures about 2mm (1/16") long by 1mm (1/32") wide. Small, yes, but weighty, solid, beautiful, and very noticeable.